History Quote: Anyone is welcome to send the Chamber any history event that they would like to see added to Mellen's History. I will post them. Send via Post Office or you can E-mail at the Chambers address. 1886 The Wisconsin Central Railroad buys part of Samuel O'Grady Bennett's homestead, which he named Iron City. 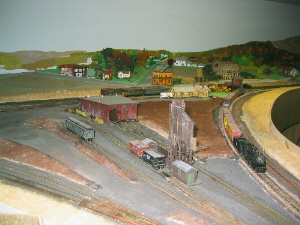 A boxcar is placed at the junction of the Penokee and Central Railroads, which had newly connected the Gogebic Range with the Ashland shipping docks. 1888 - Iron City is renamed Mellen in honor of William Solon Mellen, the general manager of the Wisconsin Central Railroad. Mellen builds its first school on West Street. Late 1800's - The Main Street building that now houses the Iron City Laundromat was erected to house a tailor's shop, and then a shoemaker's shop. 1896 - Fayette Shaw (of Boston, MA) builds 5 tanneries in Wisconsin. The largest and most productive tannery in North America is built in Mellen. The Mellen City Hall building is constructed. 1898 - George Foster (of Wausau, WI) purchases from Shaw the sawmill that was built to provide lumber during the construction of the tannery complex. Foster quickly becomes a major player in the lumber industry of the north. 1901 - The Mellen Weekly Record Newspaper is first published by James Pratt. Jim & Sandy Christl still publish every week. 1903 - The telephone connects Mellen with Ashland. Mellen gets its first bank, the Mellen State Bank, housed in Mellen's first brownstone building. This building can be seen on Bennett Street across from the Post Office. This area served as Mellen's financial district for the next 16 years. 1905 - The Lockhart building, which houses the Mellen Weekly Record, is built on Bennett Street. 1907 - Mellen votes to become a city. A.J. Sullivan, a Mellen businessman, is the first mayor. Mellen's fire and police departments are established. A veneer plant is built in west Mellen. Today, Columbia Forest Products produces veneer on the same site. A fire destroys south Bennett Street. The new brick buildings erected after this fire still serve Mellen's downtown. 1910 - The school built in 1897 burns to the ground. A new brick school is built on the same site. 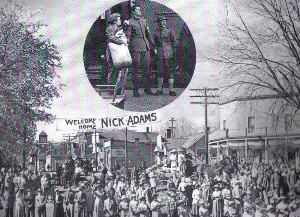 Circa 1910 - Most buildings on the east side of Main Street are constructed to house local businesses. Northland Foods grocery store occupies the building that the Block family constructed to house one of Mellen's first grocery stores. 1920 - The largest census in Mellen history was taken: 1,981. 1922 - The tannery closes. The Northern State Bank Building is constructed on Main Street. 1927 - The Legion Memorial Library is created in City Hall. 1945 - Mellen loses 24 soldiers in World War II. 1947 - Veneer mill supplys birch for SPRUCE GOOSE Howard Hughes flew the Spruce Goose only once (it wasn't spruce, by the way--it was mostly made out of birch). By far the biggest airplane ever built, the H-4, also known as the Hercules, had a wingspan of 320 feet--20 feet longer than a football field. 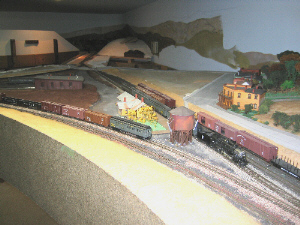 It had enough cargo space to carry two railroad boxcars. It had eight massive engines with 17-foot propellers. It weighed 300,000 pounds. And it was made of wood. 1967 - Mellen lost two local men in Viet Nam War. 1967 - Local Star Scores 54 points in Basketball Game, BOB Boettcher,before the three point rule. 1970 - High School Baseball team loses first conferance game in 14 years ending one of states longest winning streaks. 1986 - Mellen celebrates its centennial. 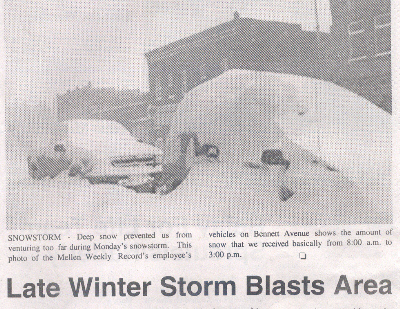 2005 - "WHAT A STORM" Mellenites are calling it the worst storm ever to hit in such a short time span. 28 inches was the official tally of snow fall that day. 2008 - The Story of Edgar Sawtelle novel. Author David Wroblewski along with the Oprah Winfrey's production crew were in Mellen filming the area described in his book. It was aired on Oprahs Live Web cam interview with David. 2010 -> All School Reunion, 4th of July weekend old classmates, friends, teachers past and present gathered for this special four day event. 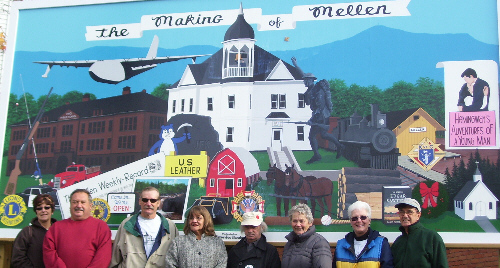 On Sept. 16, Mellen became Wisconsins first "Trail Town". This honor was presented to Mellen by the North Country Trail Association which recognizes a community through which the trail passes and accomodates hikers and other trail users. Mayor Joe Barabe accepted two trail markers identifying Mellen as a Trail Town. The North Country Trail runs from North Dakota to New York, a distance of 4600 miles. Ashland Area Development Association recently named Terry Peters Logging as "Business of the Year"
Members of the Mural committee. With Irene (Levelius) Buzzell Artist.